This is one of my all time favorite hymns. I like both the words and the beat. I like to sing it and clap my hands and sway a little bit too. Not too much movement, because I don’t have a lot of rhythm, but I do have enough to get into this song. I love this song! So today I am starting five days of songs about the blood of the Lamb leading up to Easter Sunday. Let me say this as clearly as I can; if you think you can have a bloodless Christianity, you do not have a Biblical Christianity. (18)For you know that it was not with perishable things such as silver or gold that you were redeemed from the empty way of life handed down to you from your forefathers, (19)but with the precious blood of the Christ, a lamb without blemish or defect (1 Peter 1:18-19). I think some Christians need to get over their fear of not being accepted by unbelievers and begin to sing confidently, humbly and passionately about the blood of Lamb that was shed to purchase our redemption. There are other Scriptures that speak about the blood of the Lamb and I will share some of them over the next few days as I share five of my favorite songs about the blood of the Lamb. I would also like to encourage you to begin to pray for your church’s Easter service and for unbelievers to come and fully understand the message and to experience the redeeming power of the blood of the Lamb. Pray for backslidden Christians to repent of sin and worldliness and to surrender their lives to the Lord. Pray for all of your church’s ministries to be done in the power of the Holy Spirit. 1. Have you been to Jesus for the cleansing power? Are you washed in the blood of the Lamb? Are you fully trusting in His grace this hour? Are you washed in the blood of the Lamb? (Chorus) Are you washed in the blood, in the soul cleansing blood of the Lamb? Are your garments spotless? Are they white as snow? Are you washed in the blood of the Lamb? 2. Are you walking daily by the Saviour’s side? Are you washed in the blood of the Lamb? Do you rest each moment in the Crucified? Are you washed in the blood of the Lamb? 3. When the Bridegroom cometh, will your robes be white, Pure and white in the blood of the Lamb? Will your souls be ready for the mansions bright And be washed in the blood of the Lamb? 4. Lay aside the garments that are stained with sin And be washed in the blood of the Lamb; There’s a fountain flowing for the soul unclean; Oh, be washed in the blood of the Lamb. God bless you and may you experience the presence and power of God in your church service this Sunday! Stay faithful and hopeful until Jesus returns in glory. I’ve had some time away from blogging and am ready to get back to it. 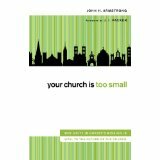 Today I’ve posted a new book review onJohn Armstrong’s book, your church is too small. I recently attended the Southeast Regional Meeting of the Evangelical Missiological Society and presented a paper titled The Biblical Basis For Multigenerational Church Planting Teams In North America. It was the first time I have attended something like this and it was both enjoyable and educational. I like the writing of J. C. Ryle and want to encourage you to look at the book giveaway post below. They will draw a winner for the book on Saturday March 13, 2010. Even if you don’t want to enter the contest for the book, “Meet the Puritans” consider learning about Ryle and his ministry. Most of the daily quotes encourage me and cause me to think about the Lord. I hope they do the same for you too. To enter this contest go to this site: www.jcrylequotes.com . If you like Ryle’s writing you will like this site. If you are not familiar with Ryle, I put three quotes on my Quotes Page today. I got them off of this site. The book looks pretty good too. Check the site out, you may like it. While you are there you can enter the contest. They will draw a winner for the book on Saturday March 13, 2010. While out on a date with my wife I came across some really good decaf coffee. Now, I’m neither a coffee expert nor a coffee snob, but I know what I like and what I don’t like. One weekend in the fall, my wife wanted to go to Rainbow Blossom, a local organic food store because they were having a gluten-free food tasting event. So we go up to New Albany, Indiana and we are walking around the store trying food and getting what we wanted to buy. I turn a corner and there is a lady handing out coffee. Now I’m always up for trying some coffee. It smells really good and she asks me if I want regular or decaf. It’s in the afternoon so I take decaf. I like to try new coffees black, nothing in them at all. I take a sip and my first thought is, “man this coffee is good!” I call to my wife and tell her, “you have to try this coffee, it’s really good.” She liked it too. So we bought some. 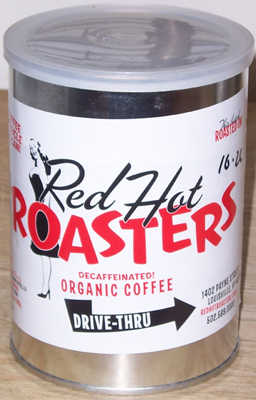 The decaf is from Red Hot Roasters and you can find them here: www.redhotroasters.com . The owner and roaster is Sondra Powell and she is a really nice and friendly lady. Her coffee shop is located at 1402 Payne Street, Louisville, KY 40206. It is a little shop and it’s only a drive-thru. 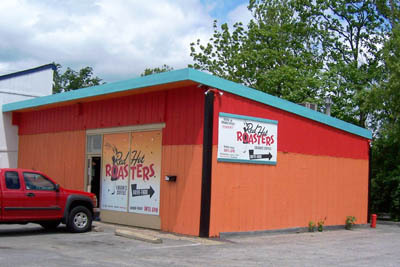 Red Hot is the smallest roaster in the city and the coffee is organic. She believes in accountability and sustainability. It comes in recyclable tins or you can bring them back to fill up with coffee again. Sondra only roasts seven pounds at a time. It’s a Peruvian coffee in a light French roast and a water process decaf. So I went back and bought some decaf the other day and my wife and decided to brew it in the auto drip and the Chemex www.chemexcoffeemaker.com . The auto drip was first. The coffee beans have a good aroma and they are a little bit oily. It is a strong coffee but not overpowering and slightly acidic. 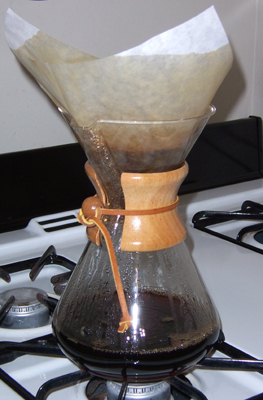 The next day we made it in the Chemex. The taste is very clean and strong. There was the lingering taste of coffee in our mouths, but no bitterness. My wife and I thought the Chemex coffee maker could spoil us. It always makes the coffee taste better, even when you drink it black. We are always looking for a good decaf. After lunch we don’t usually drink coffee or tea with caffeine. Both of us like the taste and smell of coffee, but sometimes not the caffeine. We have tried a lot of different decafs. We think this Peruvian light French roast decaf from Red Hot Roasters www.redhotroasters.com is one of the best we have tried so far. If you are looking for a good decaf you can’t go wrong here. Oh, and you can get it whole bean or ground. I was thinking I have another reason to go out on a date with my wife; we have to try her regular coffee. I’m guessing it’s as good as the decaf. I’m looking forward to it! Sometimes I like to imagine myself having a great voice. You know, one of those voices that just booms. One of those voices that just sounds good. When I sing I have to imagine I have one of the those voices because I don’t. I have one of those voices that can change key in the middle of a song and I couldn’t tell you what key we started in. But you see I like to sing and praise the Lord who saved me. I’m not usually too shy so I will sing out when I’m in church. I know what it is like to make a joyful noise to the Lord. I also know what it is to sing while I’m alone worshipping God. Which got me thinking about songs we usually only sing around Easter. These songs could be sung any day, but usually they are reserved for special days. One of my favorite Scriptures that helps me sing praises to God even when I don’t feel like it is Psalm 50:23. He who sacrifices thank offerings honors Me, and he prepares the way so that I may show him the salvation of God. (NIV). I don’t pretend to have a great singing voice, but I can sing praises to the One who redeemed me. I know He does not get tired of hearing me make a joyful noise to Him. Sometimes when it is difficult for us to sing praises to Him is when we should make ourselves sing. Somehow, the sacrifice of my praise honors the Lord who redeemed me. Somehow it prepares the way for the salvation of God. I don’t pretend to have the greatest singing voice. That doesn’t matter to God. More importantly, I don’t have to pretend that I am redeemed and my name is written in the Lamb’s book of life, I am assured of that truth. I can gladly offer the sacrifice of praise any day including Easter Sunday. There are a lot of good Easter songs, so I’ll share five with you that I am glad were written. I look forward to singing them and I hope you do too. 1. Low in the grave He lay – Jesus my Savior! Waiting the coming day – Jesus, my Lord! (chorus) Up from the grave He arose, with a mighty triumph o’er His foes; He arose a victor from the dark domain, And He live forever with His saints to reign. He arose! He arose! Hallelujah! Christ arose! 2. Vainly they watch His bed – Jesus, my Savior! Vainly they seal the dead – Jesus, my Lord! 3. Death cannot keep his prey – Jesus, my Savior! He tore the bars away – Jesus, my Lord! Go ahead, sing Christ Arose, offer the sacrifice of praise. You’ll be glad you did. Jesus has triumphed over death and the devil. The power that raised Jesus from the dead is at work in us who believe. Hallelujah! I’ll say it again; the power that raised Jesus from the dead is at work in us who believe! (18)I pray also that the eyes of your heart may be enlightened in order that you may know the hope to which He has called you, the riches of His glorious inheritance in the saints, (19)and His incomparably great power for us who believe. That power is like the working of His mighty strength, (20)which He exerted in Christ when He raised Him from the dead and seated Him at His right hand in the heavenly realms, (Ephesians 1:18-20 NIV). Before I begin to read a book in-depth, I skim through it and read parts of it. Recently I received your church is too small by John Armstrong to both read and review. On a quick glance one of the things I like about it is the quotes. I’m a lifelong collector of quotes. In about a week and a half I’ll post a review of it. But for now, here’s a good quote. “Disturb us, Lord, when we are too well pleased with ourselves, when our dreams have come true because we have dreamed too little, when we arrive safely because we sailed too close to shore. Disturb us, Lord, when with the abundance of things we possess we have lost our thirst for the waters of life; having fallen in love with life, we have ceased to dream of eternity; and in our efforts to build a new earth, we have allowed our vision of the new heaven to dim. I’ll try to stop here even though I could go on. Specifically, I’m thinking of Romans 12:1-2. Maybe we don’t understand “surrender.” Maybe the battle between the flesh and the spirit never stops. Maybe we have discounted the resources and power of Almighty God like we have to so many things and people around us. Maybe we need a personal revival. Maybe our family’s, our churches, and our community’s need us to have a personal revival. Maybe we are too comfortable or afraid to be disturbed. Only we and the LORD really know the answer to that! Please disturb us Lord. I have added a book review of The Masculine Mandate. I would like to leave you with one of my favorite poems. I don’t think I could tell you another poem that Robert Frost has written. I have liked this since I first read it when I was in junior high school (I think that is when it was!). It reminds me of how important our choices are and of just being able to calmly decide to take a chance. I liked it when I was unsaved, I like it even more now that I am saved. I can risk everything for God. I can choose to follow even when I don’t know where He is leading! I can trust Him! Praise the Lord!